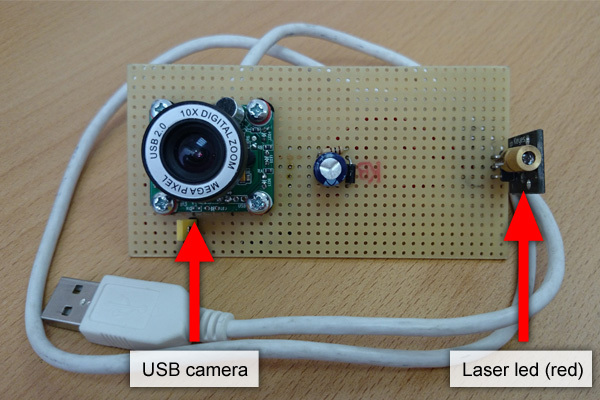 This lecture demonstrates how to achieve Laser Distance Measurement in C# by using a USB camera and a laser diode. To implement this example, you need to have OZEKI Camera SDK installed, and a reference to OzekiSDK.dll should be added to your Visual Studio project. To establish the connection properly between your application and an USB camera you should apply the same code snippet what you have used in the example (How to connect to an USB camera and display the picture in C#?). Important: you should study this article in order to find out how to set up your Windows Forms Application correctly. To compile this example you will need Microsoft Visual Studio installed on your computer. To find the implementation of creating the connection between your USB camera device and your application, please visit this site. the DistanceMeasurementHandler _distanceMeasurementHandler to manage the distance measurement. When you hit the connectBtn button, then the application connects to the _webcamera and to the _distanceMeasurementHandler. Every time when a new frame arrives from the camera to the distance measurement handler, it makes the calculation between the laser dot and the camera (after it was calibrated). You need to connect the _distanceMeasurementHandler to the _imageProvider, set this image provider to _videoViewer using the SetImageProvider method, then start the web camera and the video viewer. Subscribe on the OnRangeChanged event of the distance measurement handler and when it occurs then you will get the current distance. 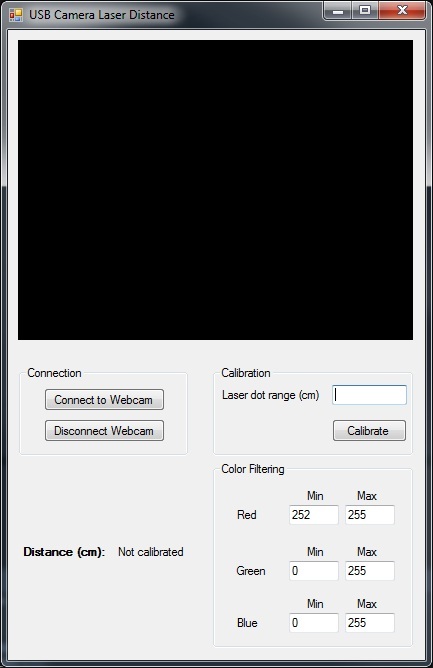 When you click on the calibration button then you need to measure the distance manually via the MeasureDistance button of the distance measurement handler, then call the DoCalibration method with the range string parameter. Then set the calibrationData's isCalibrated component to true. After the successful implementation of the functions and the GUI elements, the application will work properly. By pressing the Connect to Webcam button the image of the USB camera will be loaded in, and you can disconnect from the camera by pressing the Disconnect Webcam button. To measure the distance between an object and the laser, you must make some calibrations to the application. Set the device so that is pointing on a close object, add the Laser dot range (in cm) and press the Calibrate button. After the calibration of the distance between the laser and the object the Graphical User Interface will show you the distance. At the Color Filtering section you can set the values of the color filters which serve as an effective filter of the original image to get the blobs (binary large objects). The image processing and object detection technologies use blobs as their main resource. If the problem still consists you should try the application with another camera device. How can I get the URL of the camera? I have not managed to build the solution. How to solve it? Please set the Target framework property of the project to .NET 4.0. You should add the OzekiSDK.dll to the references of the solution. Please import the missing classes.